One of my goals this year was to catch at least one fish a month. I had a open slot at a private lake called Clearwater but it was cancelled due to snow. This has been the coldest winter I have experienced since living in NC. I tried to fish the Neuse last weekend but it was way too high. 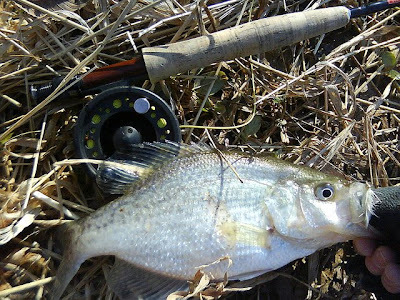 I received an e-mail this week from a friend who fishes the Neuse regularly. I had to read his e-mail a few times cuz I couldn't believe he said he caught over a dozen crappie the same weekend I was at the river. It seemed impossible, but then again this was John. I call John the Neuse Master because he knows every submerged rock and log on the Neuse river. He is a pleasure to fish with and enjoys the company of other fisherman who have a passion for fly fishing. He invited me to check out one of his secret fishing holes. I was looking forward to this all week and when I met with John, I was eager to get on the water. When we first walked to the river it looked just as high as I remembered. I was wondering where we were gonna fish. I started to think maybe John has some technique I have no idea about. We hiked for a bit and came to a huge eddy where the river current swirled inland and made its own small creek. The casting conditions were tight but manageable. It looked really fishy and it didn't take long to catch my first fish. I couldn't land it and after few seconds my line shot out of the water fly less. Figuring out how to detect the strikes and the right retrieve was challenging. 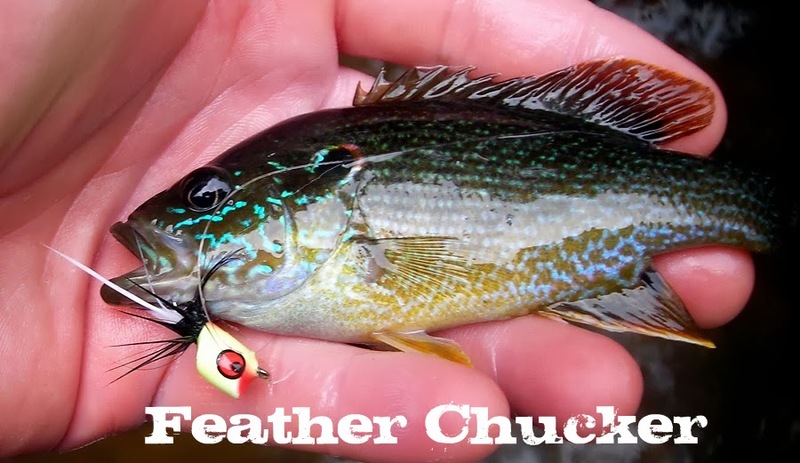 I found that whenever my fly felt like it was dragging on the bottom that's when a fish was on. I wouldn't officially know until I lifted the rod and it would start to bob. My best retrieve seemed to be half to foot long strips of line. The first fish I was able to land looked a little strange to me. It was pretty white for a crappie. Once I got it closer John yelled, "that's a white bass." 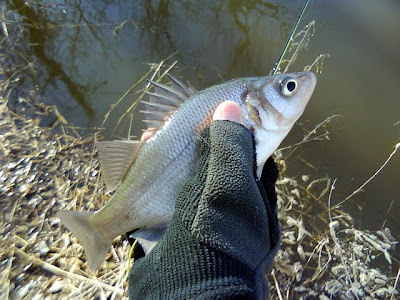 My first white bass! I've been wanting to catch one of these for a while. It wasn't a monster but still a trophy to me. 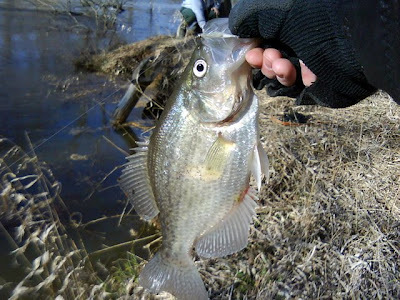 I happily let him go and it wasn't long until I had my first crappie. Most of the fish I caught were around this size. We spent the rest of the morning missing and catching fish. I caught a few really nice ones. I lost the biggest of the day when it ran into some submerged brush right at my feet. I tried several things to get it out but it was too deep and I had to snap the line. Often we were surprised with fish this size it was an awesome day. I'm looking forward to coming back. I finally have something to fish for in the winter. While we were fishing we were visited by an otter which was icing on the cake. I'm always amazed at how much wildlife there is on the Neuse. We finally had some 60 degree weather here in Raleigh. I decided to try my luck fishing for some crappie on the Neuse. I had not white flies so I stopped by the Great Outdoor Provision to get some White Buggers. Of course they were out, they've been out for awhile and I had to get a clouser type substitute. Little did I know this all was a waste of time. Since the weather was so nice the usual places people stop to hike around falls lake and the dam were jam packed with cars. It was pretty rediculous. I found a place to park and rigged up before looking at the water. That was my first mistake. As I drove up I glanced at the river a few times and I saw what looked to be good places where ice was still on the water. After I started to make my way to the river I could see the white wasn't ice but foam. The river was moving at break neck speeds. The usual places where I walked were under a good 3-6 ft of water. It was pretty spooky actually. One slip and you'd be downstream in no time. I knew pretty much my fishing day was over. I made some futile attempts to fish some eddies but it was pretty much a joke. Next time I'll make sure I check the water flows before heading to the river. It hasn't rained much in the last week so I figured the water would have been down. I guess I didn't think about all the snow that's probably melted up north.